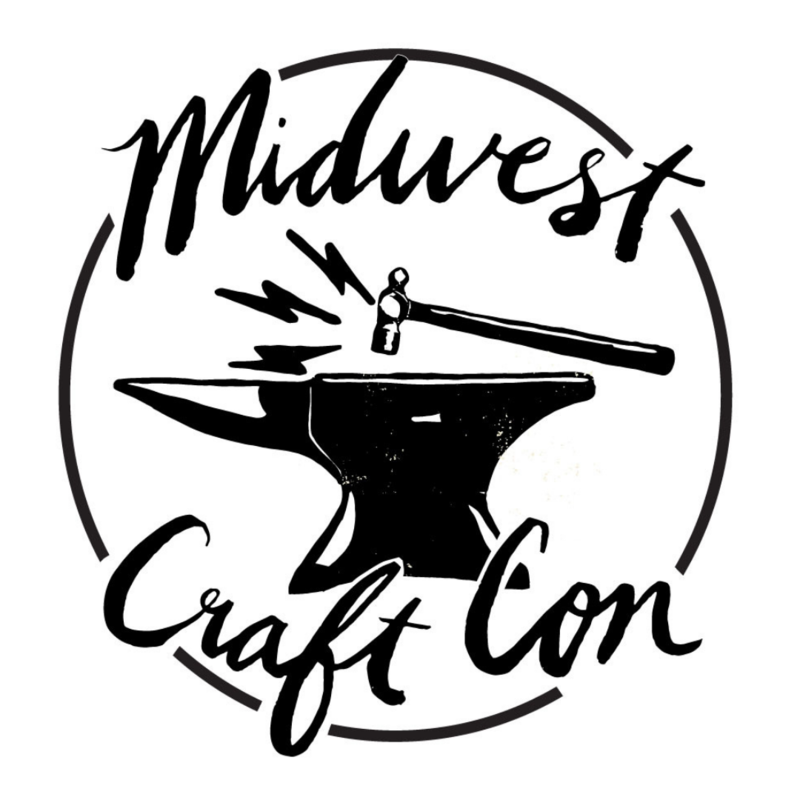 At Midwest Craft Con’s 2016 event we invited dozens of experts from creative fields to share their expertise and opinions in breakout sessions and panels. The two cornerstones of the event were our keynote speakers: Lisa Congdon and Abby Glassenberg! Fine artist and illustrator Lisa Congdon is best known for her colorful abstract paintings, intricate line drawings, pattern design, and hand lettering. She works for clients around the world including the MoMA, Martha Stewart Living, Chronicle Books, The Land of Nod, Simon & Schuster, and Cloud9 Fabrics, among many others. She has exhibited her work around the country, including in shows at the Contemporary Jewish Museum and Bedford Gallery and is currently represented by Uprise Gallery in New York. She is the author of five books, including Art Inc: The Essential Guide to Building Your Career as an Artist, Fortune Favors the Brave, Twenty Ways to Draw a Tulip, A Collection a Day and Whatever You Are, Be a Good One. She lives and works in Portland, Oregon. Follow Lisa on Twitter and Instagram! Abby Glassenberg is a sewing pattern designer, craft book author, teacher, and writer. On her blog, WhileSheNaps.com, she writes about the sewing industry, running a creative business, and the online culture of craft. Abby has an undergraduate degree in history from Johns Hopkins and a master’s degree in education from Harvard. She taught middle school social studies in Mississippi through Teach For America, and sixth grade in the Newton Public Schools before becoming a textile artist. She’s the author of three sewing books. Abby lives in Wellesley, Massachusetts, with her husband and three daughters. In addition to her keynote speech, Abby will also be presenting a session on Awesome Email Newsletters. Follow Abby on Twitter and Instagram! Jennifer Ackerman-Haywood was born in Detroit Rock City and now lives in West Michigan with her husband, Jeff, and two daughters. She makes a living teaching craft work shops, working as a freelance feature writer, art & craft columnist, adjunct journalism professor and selling wooden weaving looms and handprinted goods in her Etsy shop. She hopes to realize her childhood dream to write a book very soon. She likes to quilt, knit, weave, sew, carve blocks, pull prints and do just about every craft under the sun. She’s almost always armed with a portable project. She started the Craftsanity podcast in late 2005 while on her second maternity leave from her newspaper gig. She continues to interview artists and crafters from around the globe, review the latest books and products and share fun project ideas you can try out in your home studios or with a group of artist friends and kids. She’ll be recording interviews at the con with anyone who’d like to tell their story! Allison Chapman has been creating since she was young, and was taught how to print on her Granddad’s letterpress in his print shop. She went to school for history and eventually completed an internship at the Smithsonian in 1994. She moved back to Minneapolis and spent a decade teaching letterpress printing, paper arts, and bookbinding at the Minnesota Center for Book Arts. After inheriting her Granddad’s 19th century press and collection of vintage images and type, Allison founded Igloo Letterpress in 1996. After moving with her family to Ohio in 2008, Allison has grown Igloo from a solo operation to a staff of talented printers and creatives. Today, Igloo is a thriving makerspace, print shop and bookbindery. In 2015, after a successful Kickstarter campaign, Igloo will quadruple its studio and retail space with a move to High Street, and dramatically expand the classroom and group workshop area. Talia Halliday is the owner of Conduit Press, an arts business specializing in hollow books and leather goods. Her hollow books can be found exclusively through Uncommon Goods and her leatherwork can be found at over 50 stores in nearly all 50 states. Halliday also organizes the Bloomington Handmade Market, an indie craft show in its seventh year in Bloomington, IN, with the help of a few very entitled and opinionated minions. Beyond that, most recently Talia decided she wasn’t being quite masochistic enough and opened up her own brick and mortar shop called Gather in downtown Bloomington in fall 2014. Gather is home to nearly 200 makers from across the Midwest and beyond and continues to grow by the day. In her spare time (oh yes, there is spare time), Talia enjoys hanging out with her crafty cohorts, spending time with her loving and adorable family, and making plans to take over the world — or at least Bloomington. Handmade Arcade (HA), founded in 2004, is Pittsburgh’s first and largest independent craft fair. Now in its 12th year, HA brings innovative crafters and progressive do-it-yourself designers to sell, their handmade, locally produced and offbeat wares at a bustling marketplace. HA is highly anticipated event that attracts more than 9,000 attendees in one day, providing craftspeople and artists working outside mainstream fine arts sectors with a grassroots, high-visibility venue to sell wares, build community, network and share their artistic practice. Handmade Arcade is run by a collective of creative Pittsburghers who have helped to shape and bolster Pittsburgh’s independent craft scene over the past twelve years. The group’s founders — who, along with new volunteers, still run the event today — were inspired to organize a craft fair of Pittsburgh’s own that would tap into a national movement and provide a welcoming venue for artists and shoppers to come together. Nikki Jenkins is an entrepreneur and mixed-media jewelry designer, the owner of Nimmy Designs, which is sold at art and craft shows, concerts, trunk shows, boutiques and online. With experience in fashion modeling, personal styling, metalsmithing and glass artistry, she is passionate about incorporating artistic vision into professional development. She is motivated by uncovering the uniqueness and beauty at the center of creativity and artistic expression. By day, Nikki is a Certified Health Education Specialist; she holds a master’s degree in education and a bachelor’s degree in psychology. Nikki specializes in project management and in personal and professional development, and her team’s work has received national recognition from the CDC for policy and environmental change integration. She has also served as an adjunct professor at the University of Cincinnati. She volunteers for local non-profit organizations, and she enjoys traveling, good eats, mud racing, music and dancing — she’s also a salsa instructor! Part chemist, part entrepreneur, part entertainer, and part pixie, Sandria Marie is a serial entrepreneur. Throughout various marketing businesses she always kept “making” as a side gig, never assuming she’d make it her career one day. Now she fuses her love for marketing and branding into the handmade movement with relentless passion and unapologetic authenticity. Sandria started her love affair with formulating natural products in college when allergies prevented her from using conventional makeup and skin care. Over the years, she taught herself soapmaking, aromatherapy, skin care and cosmetic formulating. She set out to invent products that changed the way women experienced natural cosmetics, in a non-intimidating and inclusive environment, creating Brazen Cosmetics. Never one to sit still, Sandia owns a retail store, several online stores, teaches weekly cosmetics-making classes, and hosts workshops for entrepreneurs and bloggers. Her main mission in life is to spread self-acceptance, confidence and authenticity through a creative business. In her spare time, Sandria performs in musical theatre, bakes treats for her two chihuahuas and obsessively hunts for all things pink leopard print. Kate McKean is Vice President and Literary Agent at the Howard Morhaim Literary Agency in Brooklyn, NY, where she has been representing clients in the areas of craft, art, illustration and pop culture (among many other areas) for over nine years. She earned her MA in Fiction Writing at the University of Southern Mississippi and likes to write, crochet and sew when she’s not reading. She’ll be teaching: Craft Book Publishing and will also be taking 10-minute appointments for craft book pitches! CheyOnna has lived much of her adult life split between the city she grew up in, Kansas City, MO, and the city where she found her second voice, St. Louis. She now lives in Minneapolis, MN, with her husband and two cats. In 2014, she founded The Yarn Mission, an anti-racist, anti-sexist and anti-oppression knitting collective to support and organize for Black Liberation. The Yarn Mission has shared the art and (sometimes) calm of knitting with others through community knitting sessions and facilitating learning at self-care events and workshops. As a criminologist, she have done work for the NAACP Legal Defense Fund in an effort to combat systemic racism within the criminal (in)justice system. Through her academic work, she strives to be intersectional and critical. Her time and energy is devoted to her arts (knitting and crocheting), cats, family, The Yarn Mission, Black Liberation, and working on a dissertation in criminology and criminal justice. She believes that all of those things, people, and animals are intimately related. Anne Holman and Jen Townsend have been making and selling their individual jewelry lines for a combined total of 20 years in galleries, art festivals, boutiques and online. With experiences in organizing art events and craft markets, and teaching workshops and undergraduate metalsmith courses, the pair have a wealth of experiences on both sides of the artist/retailer relationship. Each discovered their passion for working in metal while in art school and graduated with BFAs from the Columbus College of Art and Design. After many studio moves while growing their jewelry businesses, these two ended up sharing a studio where they realized they had a similar dream for a retail/studio/workshop space. In October 2014, they founded The Smithery as a working metalsmith studio and artist-made shop. Specializing in contemporary jewelry and modern craft, The Smithery has a retail storefront showcasing a curated collection of fine handmade goods from around the world. The Smithery offers workshops, hands-on events, artist trunk shows and work from over 75 independent artists in the Columbus storefront on historic Grandview Avenue. Stephanie Tardy Duimstra has over a decade of experience organizing and working in the DIY community. She helped found and is a past member of Handmade Detroit, which produces the annual Detroit Urban Craft Fair. She currently runs Type Shy, a handmade stationery company, featuring papercut art and cards made with vintage paper. She also runs Hip Hip Handmade, a site full of resources for the indie craft fair community, including an email newsletter featuring open craft show applications. Despite how dry this bio sounds, she’s actually not a crashing bore. Professor Annal Vyas teaches business planning law at The University of Akron School of Law, and he also helps run the Small Entrepreneur and Economic Development Legal Clinic, which assists small businesses and nonprofits with legal matters. Vyas is the author of the forthcoming book The Legal Guide to Starting Your Business: A Conversation and was named as one of “Ten Attorneys to Watch” in Northeast Ohio by Crain’s Cleveland Business for his work providing legal counsel to entrepreneurs. He is also the program director of The Bit Factory, the City of Akron’s internet startup accelerator, as well as the event organizer of Pecha Kucha Akron and NEXTOhio, an internet startup conference that drew 300 attendees to its inaugural event. Before teaching at Akron Law, he worked at Thompson Hine LLP, where he was part of the 19-attorney team that represented Obama Biden 2008 in Ohio litigation matters in the U.S. presidential election. In addition, he previously helped run a domestic violence legal clinic where he advocated on behalf of victims of domestic violence and sexual assault.